Ukrainian President Petro Poroshenko addressed a joint session of Congress Thursday to ask for more U.S. military aid in its fight against Russian-backed separatists. Less than a mile away, construction workers were busy building a memorial to victims of the Ukrainian Famine-Genocide of 1932-1933. The Ukrainian Congress Committee of America attempted to bring Poroshenko to the memorial site on the triangle of grass where North Capitol, Massachusetts Avenue and F Street meet next to Union Station. However, Michael Sawkiw, the director of UCCA’s Washington office, said the president’s schedule did not have room for a visit to the area, but he told CQ Roll Call in a Friday phone interview that Poroshenko is scheduled to attend the dedication ceremony when the memorial is complete. “We’re moving full steam ahead and we’re looking forward for a dedication sometime next year,” Sawkiw said. 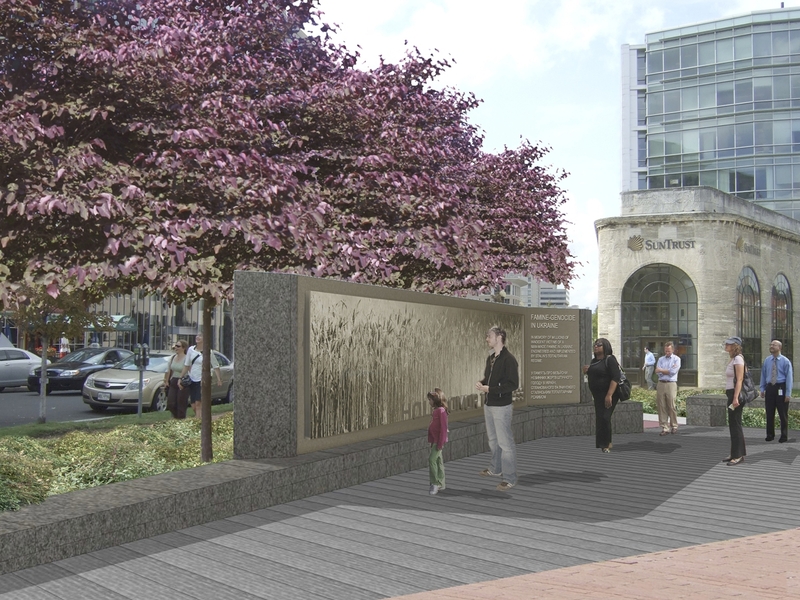 Weather permitting, the memorial will open in the late spring or early summer of 2015. The memorial is dedicated to the victims of what is known as the "Holodomor," which refers to the artificial famine perpetrated by Joseph Stalin in the Ukrainian regions of the Soviet Union. An estimated seven to ten million people died during the famine. Larysa Kurylas, a local architect of Ukrainian descent, plans to use wheat as a central feature of the memorial, which will include a bronze wall stretching down the triangle of land. Concept design for the memorial, courtesy of the Ukrainian Congress Committee of America. A bill sponsored by Rep. Sander M. Levin, D-Mich., which passed Congress in 2006 and was signed by President George W. Bush, authorized the memorial. The law also stipulated that the memorial be funded with private donations. After years of considering various designs and potential sites, the Embassy of Ukraine hosted a groundbreaking ceremony on the triangle of land in December 2013. Construction began two weeks ago, just after Labor Day. Sawkiw noted the importance of bringing attention to the tragedy in the U.S. and especially in the nation’s capital.